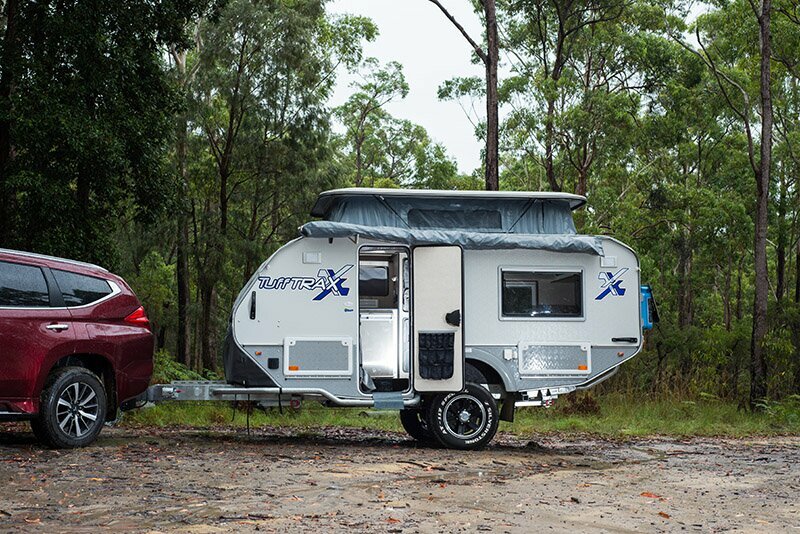 Updated below – Rumours are circulating around the internet and social media that Pakenham-based caravan manufacturer, Jurgens, has been evicted from its factory by the landlord. 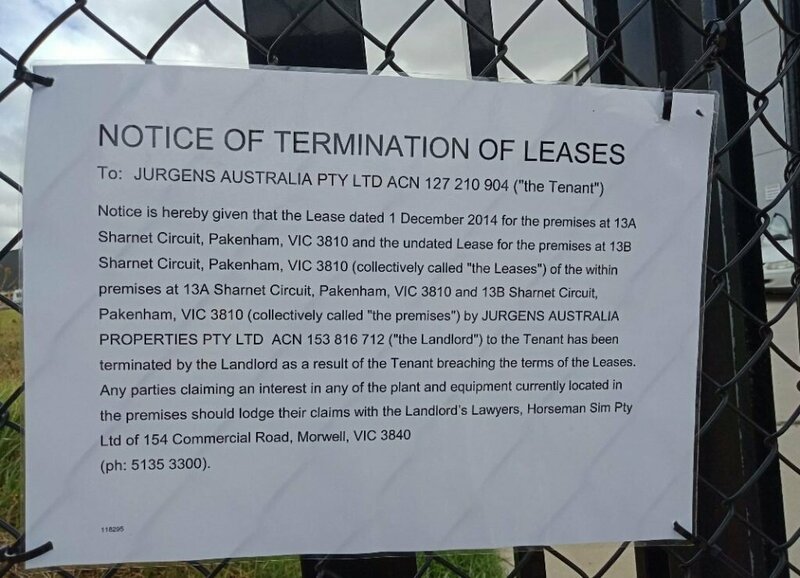 A image posted on social media shows a sign that says, “Notice of Termination of Leases – To: Jurgens Australia Pty Ltd ACN 127 210 904 (“the Tenant’). Notice is herby given that the Lease dated 1 December 2014 for the premises at 13B Sharnet Circuit, Pakenham, VIC 3810 and the undated Lease for the premises at 13A Sharnet Circuit, Pakenham, VIC 3810 (collectively called “the Leases”) within the premises at 13A Sharnet Circuit, Pakenham, VIC 3810 and 13B Sharnet Circuit, Pakenham, VIC 3810 (collectively called “the premises”) by JURGENS AUSTRALIA PROPERTIES PTY LTD ACN 153 816 712 (“The Landlord”) to the Tenant has been terminated by the Landlord as a result of the Tenant breaching the terms of the Leases. Any parties claiming an interest in any of the plant equipment currently locatted in the premises should lodge their claims with the Landlord’s Lawyers, Horseman Sim Pty Ltd of 154 Commercial Road, Morwell, VIC 3840″. Jurgens and Horseman Sim have been contacted for comment although phones have gone unanswered and messages have been left. Three of Jurgens’ dealers have been contacted – Caravans Coffs Coast, Amazing Caravans and Kratzmans Caravans, although none could give any information other than that there are rumours. None have been contacted by Jurgens management with any extra detail. In an unrelated matter, Jurgens South Africa was placed into provisional administration late in 2018, although it’s understood the issue surrounding it has been resolved. The two companies are seperate and only share branding, however a representative of Caravans Coffs Coast did say there had been a slow-down in enquires for Jurgens caravans afterwards. If we find out more, we’ll update you here. Update: On Friday, Jurgens Australia released the following statement. Various media outlets and social media speculators had reported on the closure of Jurgens Caravans Australia. The facts are as follows. We experienced a lock out by the landlord over a commercial dispute. We are pleased to advise we have resolved this issue, the gates are open and we have resumed operations. A supplier has taken legal proceedings to recover outstanding payments. We are in the process of recapitalising which has taken longer than expected. We are confident of settling all suppliers in the near future. We have a way to go with catching up with production to meet demand but please be assured we are committed to making a success of our business and rebuilding confidence in our brand. We acknowledge recent events have created significant uncertainty for our staff, customers, dealers and suppliers. We are truly sorry for the distress this has caused. Finally, we sincerely thank the many who have supported us in these challenging times. The supplier mentioned in the statement has been confirmed as AL-KO Australia, who’s been contacted, but declined to make a formal comment on the matter. Jurgens has also been contacted and confirmed the sequence of events above. We’ll continue to monitor the situation. ROAM's fearless editor, Brendan's most often found searching for the next best campsite, or fixing his caravan so it will make it to just one more.